The purpose of tool assessment and qualification is to ensure that the tool is capable of performing the particular design or verification activity to an acceptable level of confidence for which the tool will be used. Prior to use of any tools for any design and verification activities, a tool assessment is performed, and if necessary a basic tool qualification is documented and recorded. 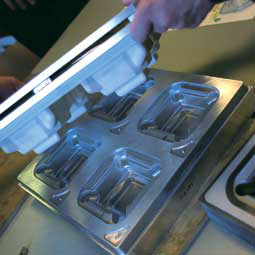 Nelipak build performance and reliability into every tool we design, our tooling qualification process is executed with agreed limits, it will ensure that product manufactured comply with the pre-determined design and development requirements. Our cross functional team of quality engineers, technical operators and manufacturing personnel can provide three levels of qualification based on customer requirements. • First article inspection carried out on first batch. Includes level 1 study with additional sample rate carried out over different cavities of the tool. On completion of the tooling qualification, data is prepared and report generated by our experienced team, this report can be used in support of the customers file registration with their notified body. Production batch records, work instructions, CoC’s (certificates of conformance), Raw Material data.